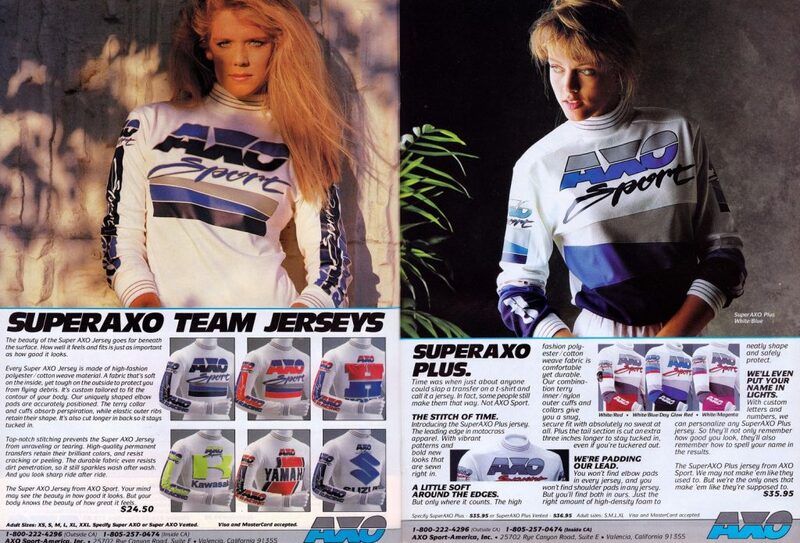 Today, AXO Sport is no longer the motocross powerhouse they once were here in the USA. They continue to produce a wide range of products for motocross, off-road, and street use, but to most American riders, AXO is more of a curiosity than a trendsetter. In Europe, they still have a fair portion of the motocross mindshare, but in the colonies, they are mostly off the radar. Once upon a time, however, that was not the case. 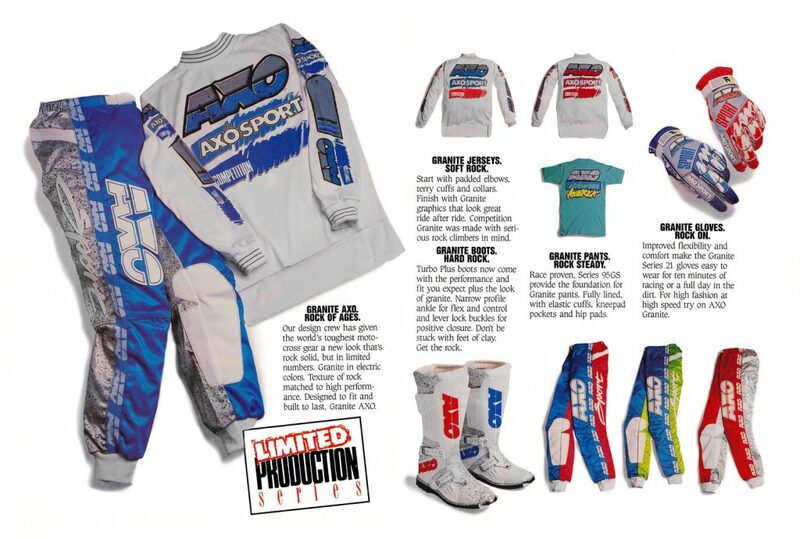 From the late eighties through the mid-nineties, few companies in motocross were as frequently at the bleeding edge of style as AXO Sport. On the track, their riders raced to victory, and off the track, their designs pointed the way for others to follow. Put frankly, AXO was cool, and in motocross, that often counts a hell of a lot more than any actual product superiority. While the nineties were the pinnacle of AXO’s popularity here in the states, their story actually goes back much farther to the late seventies and the country of Italy. There, a man by the name of Remo Berlese had the idea for a new company to produce premium quality boots for motocross. Originally, he named his new operation Easy Rider, but quickly pivoted to the name AXO of Italy. The name AXO was reportedly derived from the Italian word asso, which translates to “ace” or “winner” in English. Partly because asso could be considered problematic in English, and because “Moto-X” was the core of his business, Remo decided to spell the Italian “asso” as “AXO”. The name was also held a double meaning, as the A and O coincided with the first and last letters in the Greek alphabet. By using Alpha and Omega, and combining them with “X”, AXO could be said to be the first and last name in motocross. 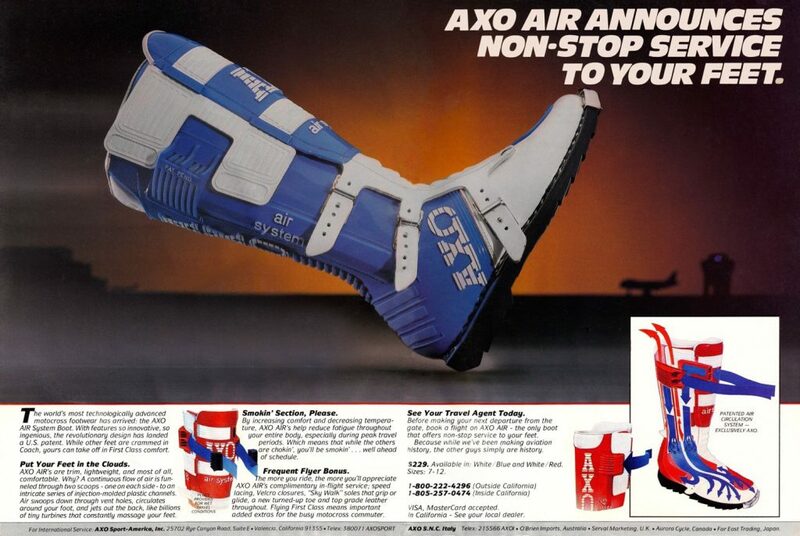 Blaze: Before the launch of AXO Sport America in 1984, AXO was a builder of boots for Fox and O’Neal. Their early offerings were innovative, but left a lot to be desired in the looks department. Initially, the core of Remo’s new company’s business was building boots for other manufacturers. 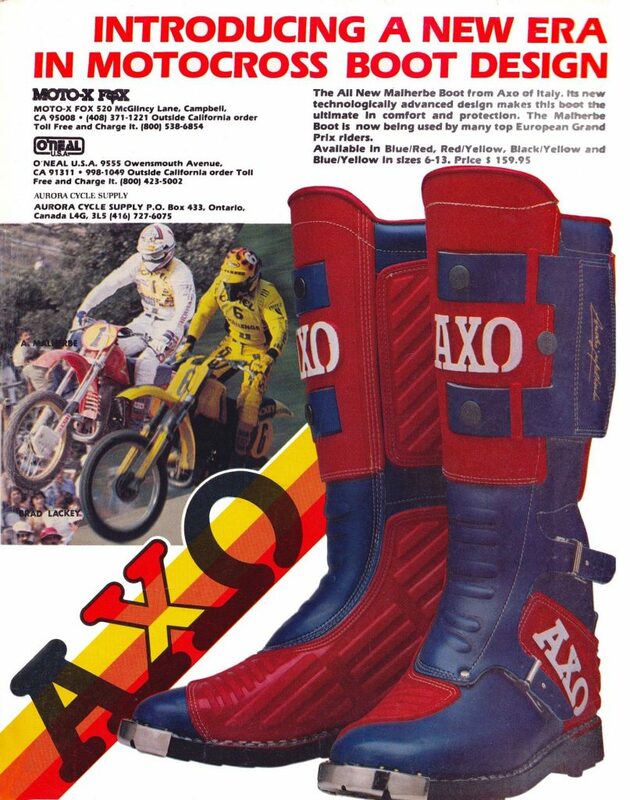 Both O’Neal and Fox Racing were early clients of AXO, selling the Italian boots through their channels. While not particularly attractive, the original AXO boots were of good quality, with innovations like combining the comfort of leather with the protection of plastic. This allowed them to be more comfortable than the Scott, M. Robert and Heckle plastic boots of the time, while still offering superior protection to all-leather alternatives. While AXO of Italy was successful selling their products through others, Remo’s ultimate vision was to build his brand as a stand-alone manufacturer. In 1982, the company took a major step forward with the release of their first big hit, the Malherbe boot. Named for 500 World Motocross champion André Malherbe, the new boot was clean, colorful, and far more attractive than the Stormtrooper-looking original AXO boot. Still distributed through O’Neal and Fox, the Malherbe boot finally put AXO on the mainstream radar. 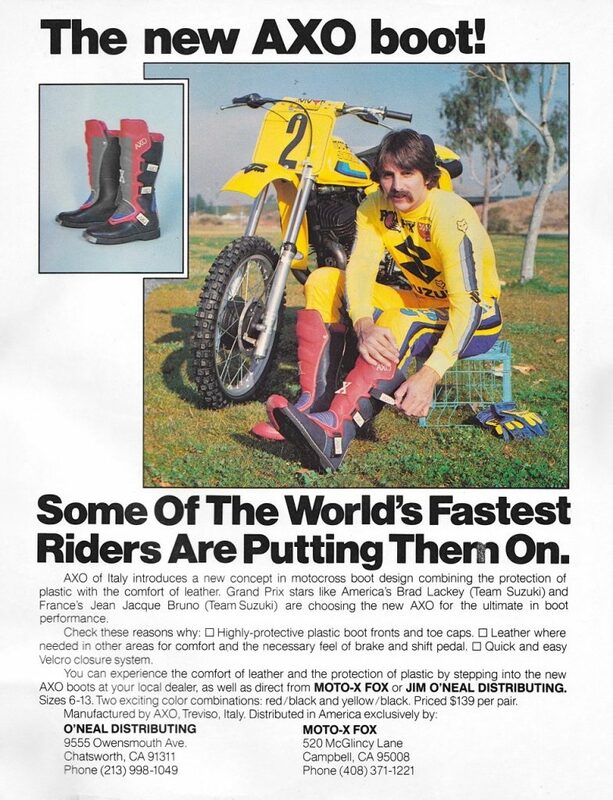 Blaze: Team Suzuki’s Brad Lackey was one of the first high-profile riders to run AXO’s new plastic and leather boot. After the success of the Malherbe boot, the brand’s next major coup was not the introduction of a product, but rather the addition of a person. In 1983, Jim Hale was a sales manager for one of AXO’s distributors, O’Neal USA. After ending his pro racing career in the early seventies, Jim had begun working for O’Neal as a sales rep and climbed his way up the corporate ladder. By ’83, Jim was looking to branch out and start his own business. 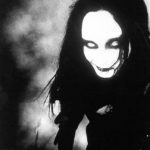 Initially, he had entered into talks to distribute Yoko gear, but when that fell through, he was forced to regroup and return to O’Neal. During his time at O’Neal, Hale had become friends with Remo Berlese through their distribution partnership with AXO. When Remo heard that Jim was looking to leave O’Neal, the Italian approached him about becoming the distributor for AXO in the USA. His only condition was that Hale had to sell AXO boots exclusively; other than that, he was free to pursue gear and casual wear as he saw fit. Eventually the two reached an agreement, and in 1984 AXO Sport-America Inc. was formed. Blaze: In 1982, the introduction of the Malherbe boot was a major step forward for AXO in terms of style and popularity. Within a year of launching AXO Sport-America, Hale would have a full lineup of gear offerings, including a new boot -the Turbo- and a revolutionary new plastic-backed glove, the Series 29. More innovations would follow, and by the end of the decade, AXO would be knocking on the door of the gear industry leaders. 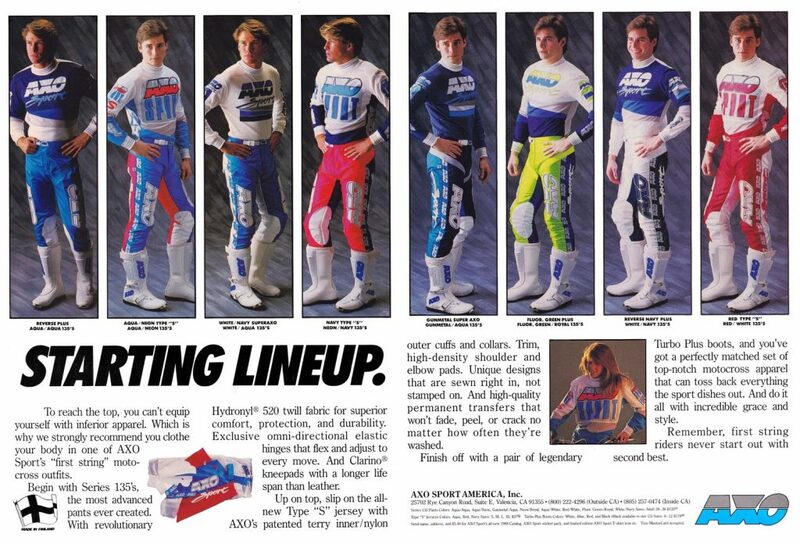 Just as we did for JT and Answer, Matthes and I are going to chronicle AXO’s rise by looking back at the products and ads that brought them from obscurity to prominence. This edition will cover the 1980s, with part VIII set to celebrate the glory years of the nineties. 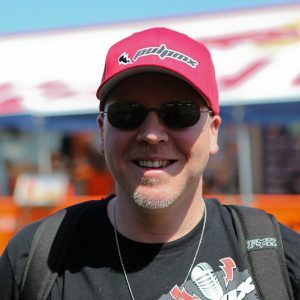 Originally, when I started putting this project together a little over a year ago, it was my intention to have Jim Hale add a little color commentary to this installment (much as Geoff Fox did when we looked back at Fox Racing). Unfortunately, with Jim’s passing, that is not possible now, so you guys are stuck with Matthes and I as we take this trip down memory lane. Hopefully, we can do the company that Jim helped make an industry icon justice. Godspeed Jim, you will be missed. Blaze: In 1984, one of AXO Sport-America’s first new products was a fresh take on an old idea. Coined the “Superbelt”, this new product featured a section of injection-molded plastic, mated to a set of nylon elastic straps. By adding color and a cool embossed logo, AXO was able to transform the kidney belt from an afterthought, into a fashion statement. 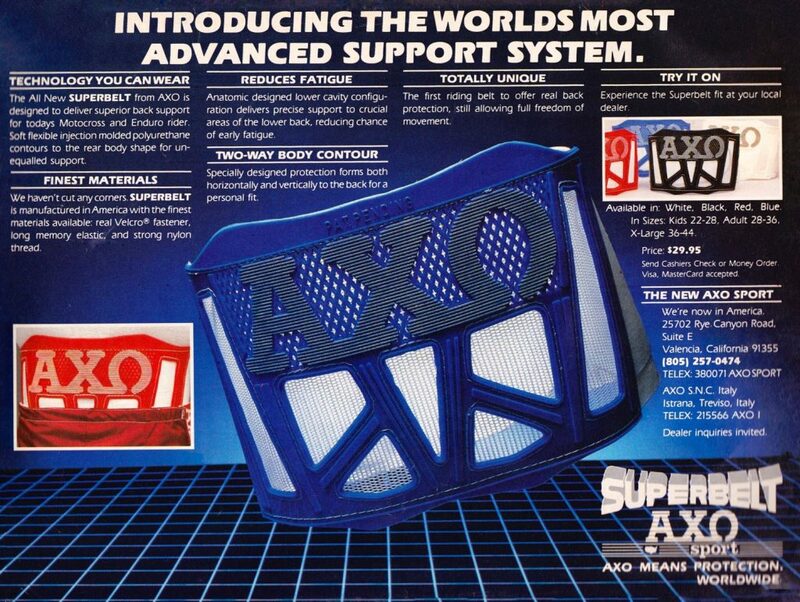 Matthes: These were big for AXO, as were kidney belts in general and really, back in the day you could just put “super” in front of anything and people bought in. For real though, I don’t remember any company using plastic for belts until AXO, they always used those black stretchy band-things and weren’t supposed to be stylish. Until these. 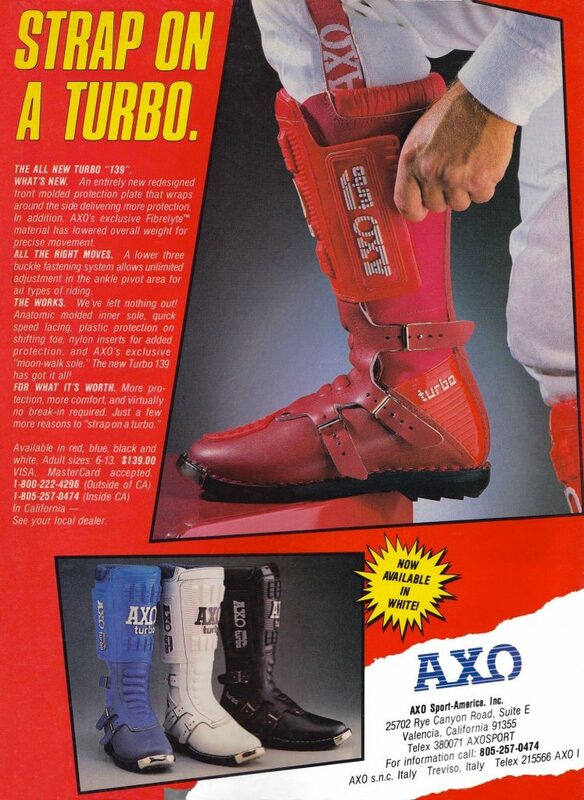 Blaze: Another big hit of AXO Sport’s early lineup was the Turbo boot. Simply styled and $45 cheaper than their high-end offerings, the Turbo was strong seller. Matthes: I don’t remember anything about this boot. 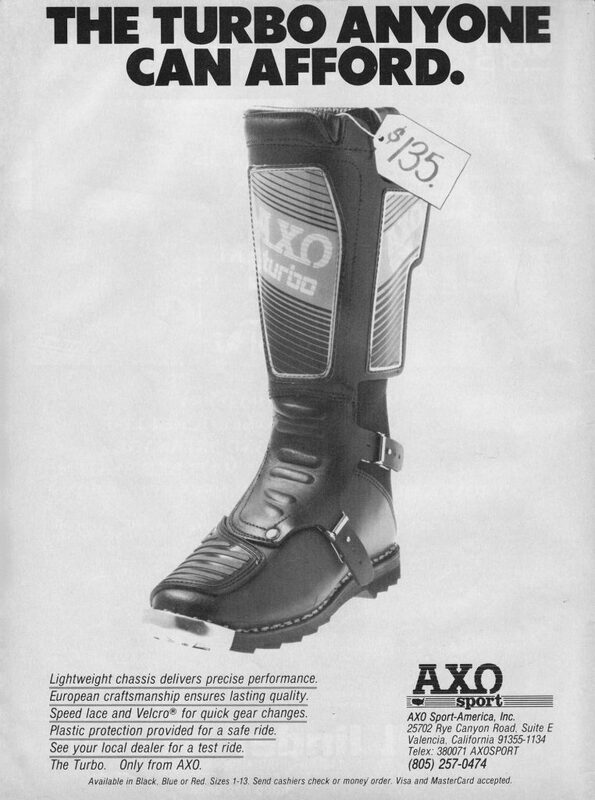 Blaze: In 1985, AXO introduced the high-end replacement for the Malherbe boot. 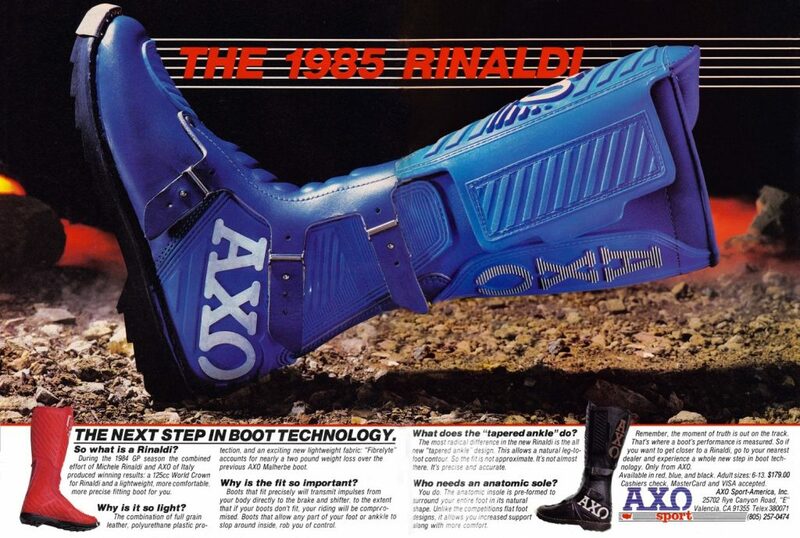 Named the Rinaldi (for ‘84 125 World Motocross champion Michele Rinaldi), this new boot featured a clean, uncluttered design, and a new synthetic construction. By replacing sections of the leather with a new material they called “fibrelyte”, AXO was able to shave two pounds off the Malherbe boot. While this new material was durable and light, it did not break in like natural leather and gave the boot a stiff feel that never quite went away. Matthes: Yeah, this one I do though! I always felt that in Canada, we got certain things that Americans didn’t and vice versa. Canadian dealers would stock more European products than the USA guys (I think anyways) and we had a shop that went ALL IN on these boots so there were a ton of them in Manitoba. I never had a pair though; it was Fox ones for me around these years. 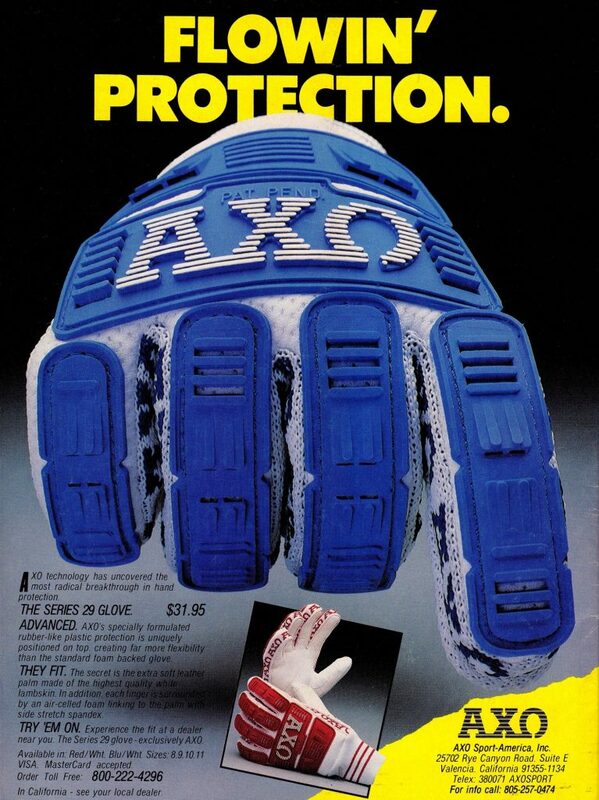 Blaze: The ’85 season brought with it AXO’s second breakthrough product, the Series 29 glove. 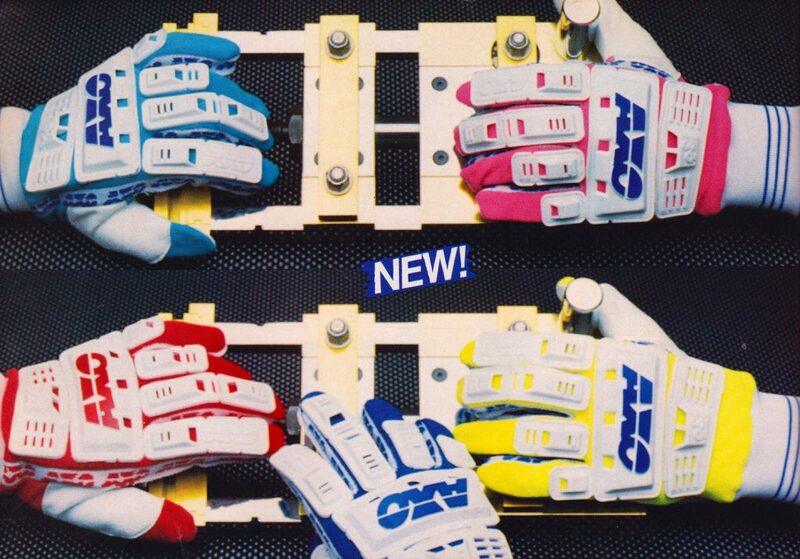 While these look like overkill by today’s minimalist glove standards, these bad boys were considered “lit” in 1985. Seriously, it is hard to overstate the sensation this glove created at the time. Literally everyone I knew had a set of these injection-molded puppies. They fit well, protected your digits and looked badass. What’s not to love? 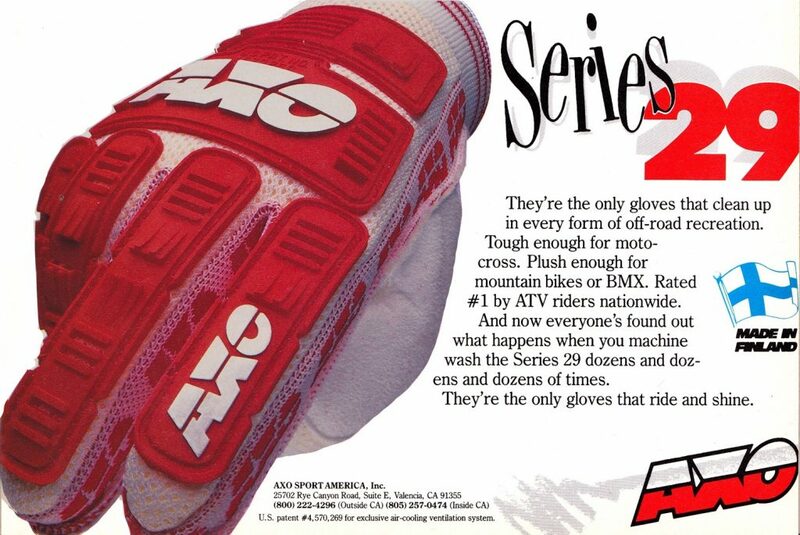 When Matthes did his podcast with Jim Hale a few years ago, Jim mentioned that this glove was their all-time best-selling product, and I can believe it. Matthes: Yes, Blaze is right. These were everywhere and very cool and unique for the time. Again, with the plastic right? The one bad thing about these is when you washed them, they curled themselves into a little ball and you could barely fit your hand in. These things were awesome though. 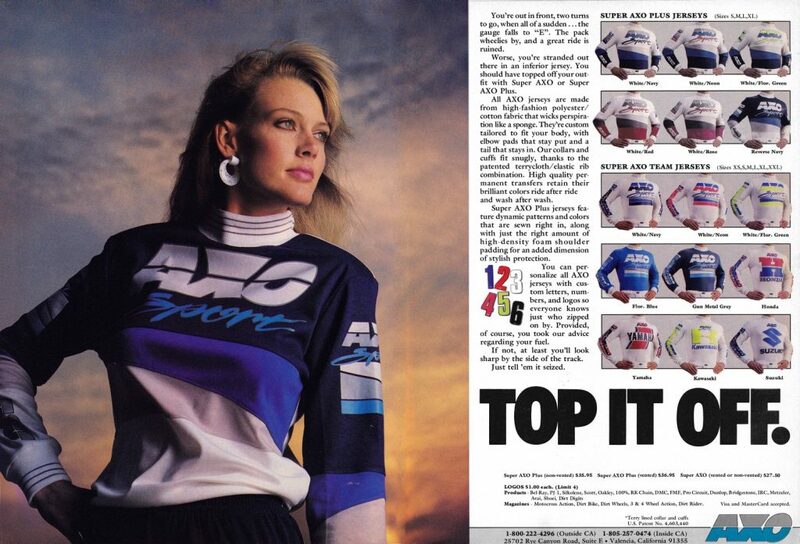 Blaze: Early AXO Sport jersey and pant designs were nothing to write home to mom about. They still used the original Greek lettering logo and were pretty cookie-cutter designs for the time. The quality was also not the best, due to Hale’s decision to source production out to a small California bowling supply company. Eventually, AXO would move gear production overseas to Yoko in Finland. Matthes: Yeah, I remember not being super pumped on this stuff. It was just meh but it represented a leap forward for AXO into the clothing end of things. Matthes: I feel like, and maybe I’m wrong, that AXO was the first company with the big collars that were all stretchy and truthfully, didn’t feel that good. You know who wore AXO this year? Danny Storbeck! Blaze: The 1986 season is when AXO Sport really started to hit its stride. A new Turbo 139 boot looked badass and offered top-grain leather construction and an improved version of their Fibrelyte synthetic leather. Matthes: Weren’t these basically the Rinaldi’s with some more plastic added on? These were also big in Canada. Blaze: A redesigned logo and much-improved looks graced the new SuperAXO jerseys for 1986. Personally, I think this stuff still looks great, even after thirty years. Lose the terrycloth cuffs and collar and I would happily run this today. Good design is eternal my friends. Matthes: Agreed Blaze on the logo, now here’s AXO hitting their stride and that jersey on the right with the pattern on the bottom were pretty cool and yeah, I’m with Blaze on the cuffs. I remember these being super progressive for their time. Blaze: I wish the redesigned logos had made it to the new Series 95 pants for 1986. When worn with the new SuperAXO jersey, it looked like an odd pairing of old and new. At least the colors were on point and I really loved the new Rose/Gun Metal and Neon Red colorways. Matthes: Blaze, I can’t look at these pants without getting mad. You see my main rival in the hot and heavy Manitoba 80cc class had the flo-orange AXO pants here and I had to see them every singe moto. And when you washed them over and over, they faded heavy. I’m out on the rose and grey ones though, pretty unique for that time. Blaze: Not every product in 1986 was a home run for AXO. The new A.I.R. 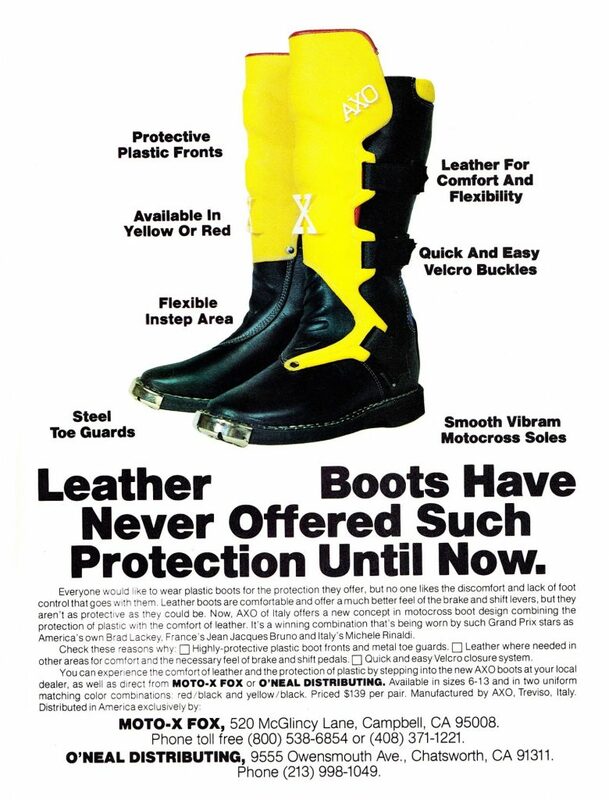 Boot cost $195 (big money in 1986) and offered air vents to provide circulation around your feet. While this sounds like a great idea, I don’t think it ever developed much traction in the market. Alpinestars tried to sell a similarly air-conditioned boot and I don’t think it did any better. Maybe having holes in a product designed to be dragged through the mud was not a great idea. Matthes: Yep, didn’t work. 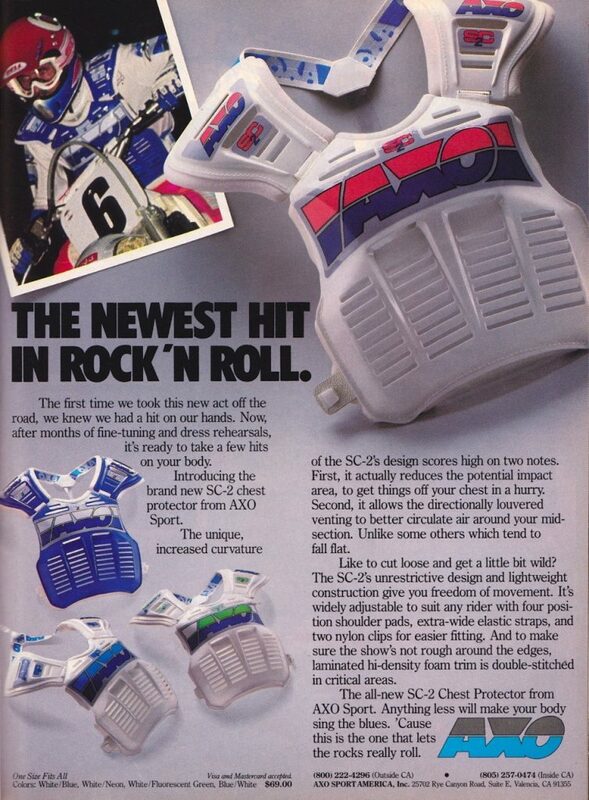 I remember MXA doing a vented boot shootout around this time and these weren’t that good. I never saw these in person. Matthes: Yeah, I felt like back then only the SX pros wore front only chest pros so you never really saw these things around. Keith Bowen wore AXO this year? Who knew? Blaze: Woo hoo! For 1987, the Series 95 pants finally got the new logo and a much-improved appearance. AXO and Honda’s new CR250R were a lethal style combo in 1987. Matthes: Yeah, now we’re getting a little better. Blaze: That collar makes me sweat just looking at it, but damn that was a good-looking jersey. Matthes: Top “it” off indeed. 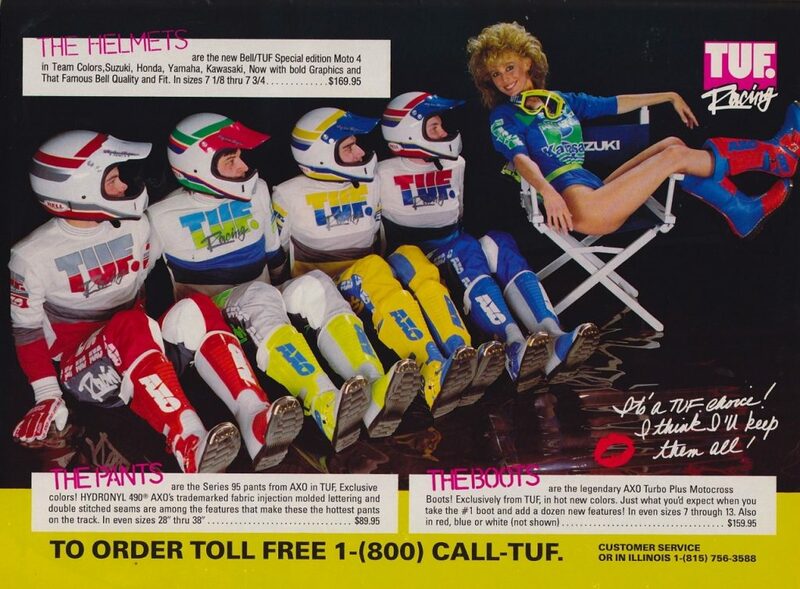 Blaze: In 1987, AXO introduced the first set of pants that really made them stand out from the crowd – the Series 135. These premium pants were made by Yoko in Finland and looked really unique. They featured a cool satin texture that was shimmery and positively glowed in the Flo Green and Neon Red colorways. They also featured trick injection-molded plastic logos that were heavy, but looked super cool. Due to the multiple stretch panels built into the design, they were also more comfortable and less prone to binding and pinching in you more sensitive areas. Good stuff! Matthes: You’re right Blaze, these represented AXO coming into its prime as a company. These pants were game changers, I had the green ones on my Kawi and they fit so good compared to my JT’s. I don’t know what you’re talking about being heavy Blaze, they were fine. Man, these fit good! Blaze: A new Limited Edition Bright Red and Florescent Blue Turbo Boot spiced up things for 1987. 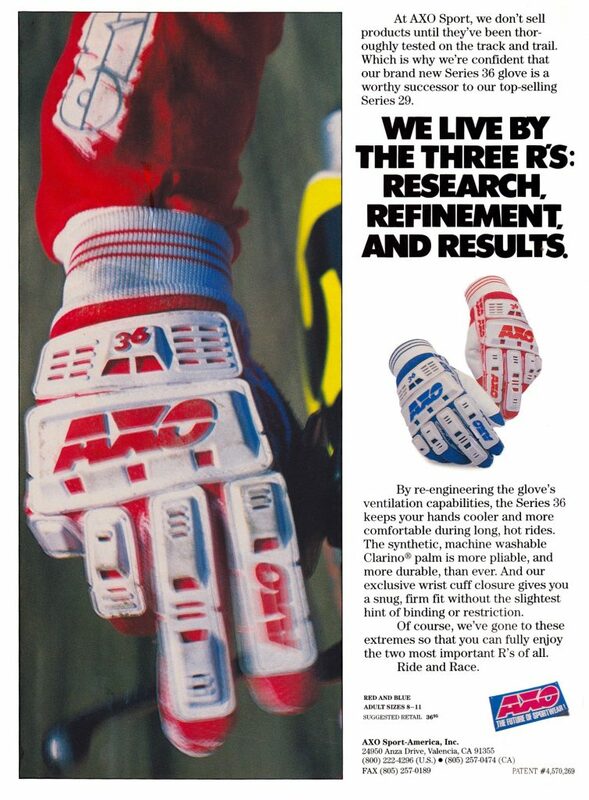 Blaze: After the introduction of the Series 29 glove, virtually every gear manufacturer was quick to copy AXO and come out with some kind of plastic-backed glove of their own. 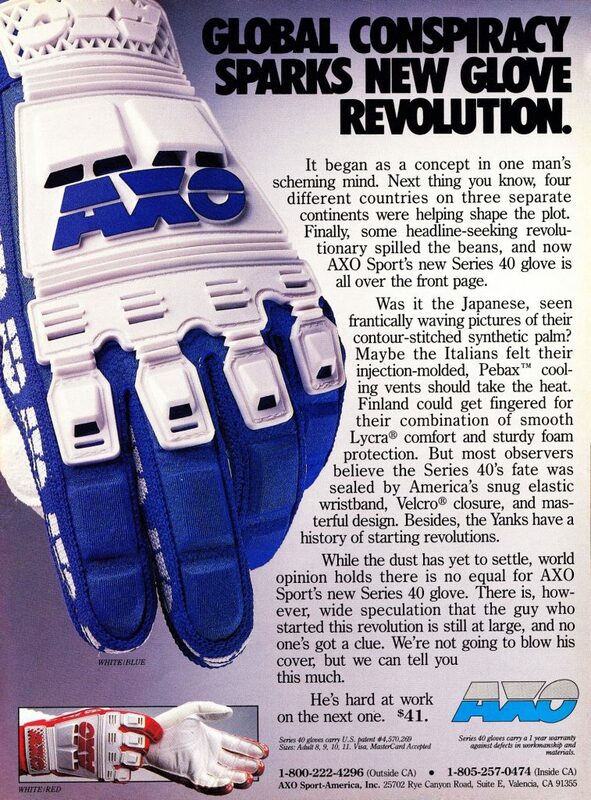 In 1987, AXO tried to one-up the competition again by introducing the new Series 40. This glove was more advance and cleaner in design, but not nearly as groundbreaking (or popular) as the original Series 29. Matthes: Yeah, I loved the Series 29’s but never had these for some reason. 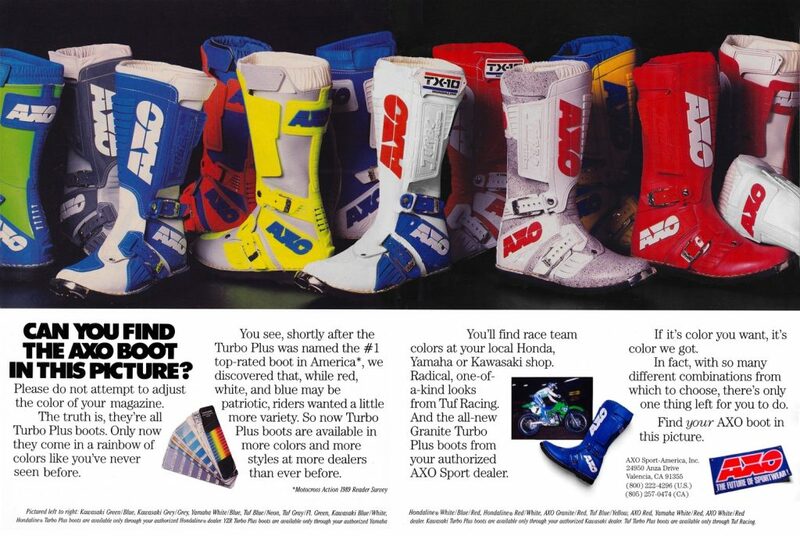 Blaze: The two big stories in the AXO world for 1988 were the introduction of a new boot to replace the wildly successful Turbo 139, and the acquisition of 1987 Supercross champ Jeff Ward. The new Turbo Plus boots were totally redesigned and far sleeker in appearance than the somewhat busy 139s. 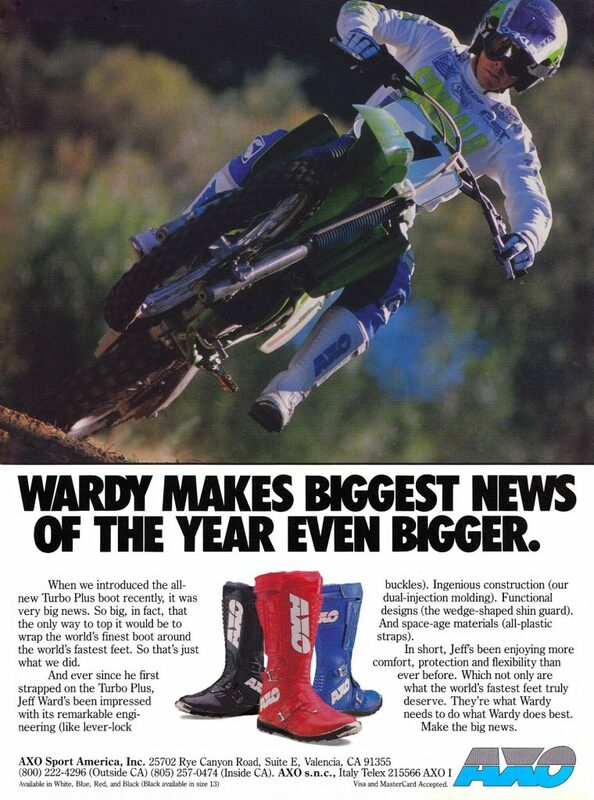 While the new boots looked great, they did not seem to do Ward’s fragile ankles any favors during the 1988 Supercross season. Matthes: Wardy switching to AXO boots and kidney belts was big news and the revamped kidney belt with the hard plastic was super cool. AXO’s also got a cool logo going on at this point and a neat name, a couple of things marketing experts say you need to have. Blaze: A new Superbelt 2 for 1988 cleaned up looks by updating the logo and adding some new colors. 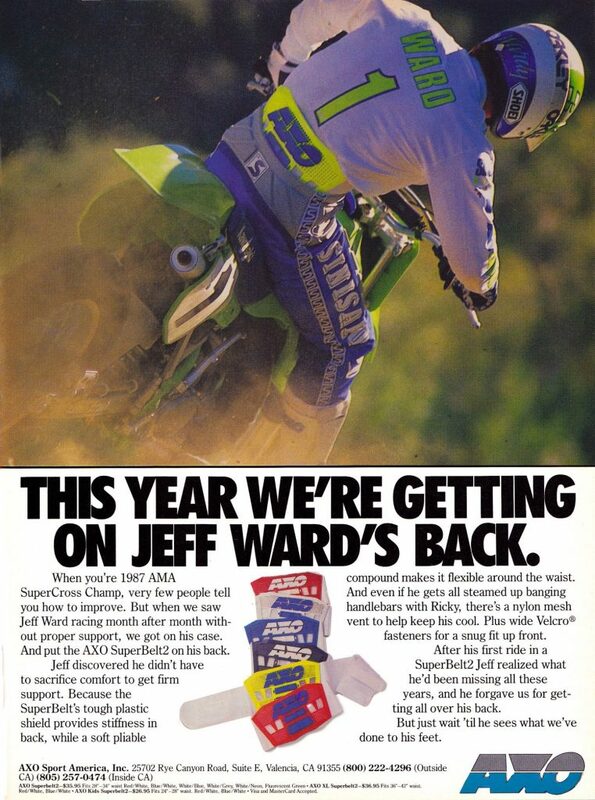 I always thought it was interesting at the time that Jeff Ward ran AXO boots and their kidney belt, but stayed with Sinisalo for everything else. I think this was due to some agreements Jim Hale had with Sinisalo to market the Finnish brand here in the USA. Matthes: Love this belt, looked SO cool, I had the green one and the only bad thing is the bottom of the plastic would dig into my back here and there. These things must’ve sold like hot cakes. Blaze: If garden variety red, white and blue were not your bag of boots, you could always dial up Dave Antolak’s Tuf Racing in Illinois and pick up your new AXO Turbo Plus boots in some really retina-searing color combos. Matthes: Yeah, the TUF name was pretty cool back in the day and think about it…TUF and AXO…similar kind of deal right? 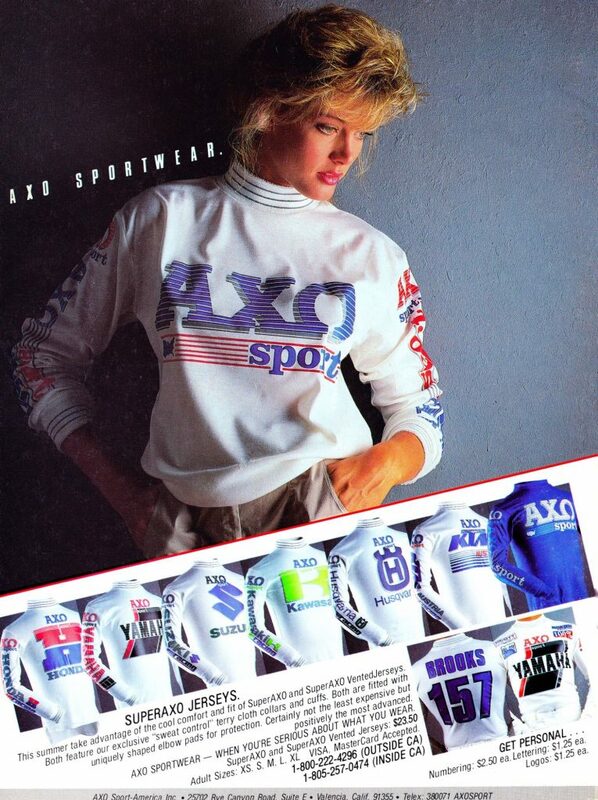 Blaze: New colors and a stylish new Type “S” jersey highlight the AXO gear lineup for 1988. I really liked the Type S jersey, particularly in the sweet Aqua/Neon colorway. Matthes: My buddy Curt had that set there Blaze on his ’88 CR80. I had the green pants and then all blue jersey. We killed it out there. Again, these pants fit so good compared to just about anything else I had worn at this point. Shiny also! Blaze: The good old Series 29 was still in the AXO stable for 1988, with revised logs and freshened-up looks. 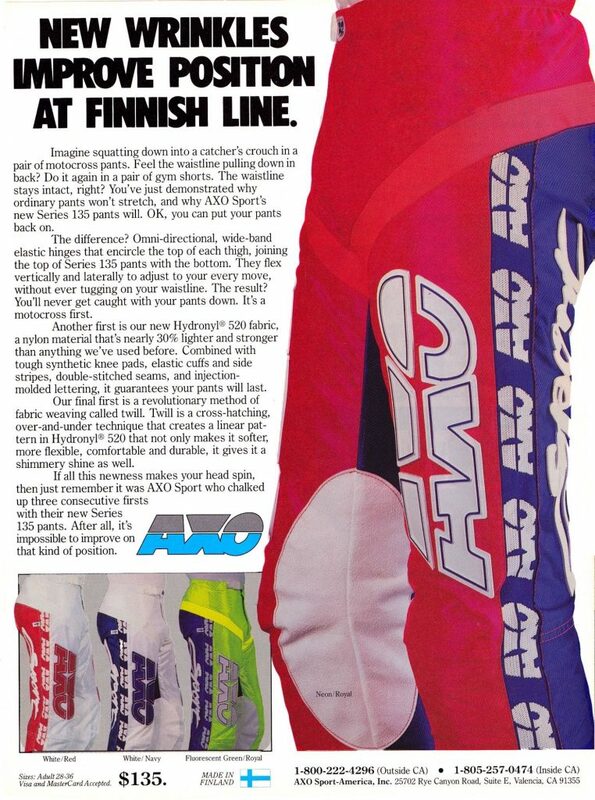 Blaze: For 1989, AXO introduced one of my favorite pant designs of the eighties, the new 125 ST. Using a super-colorful and incredibly-durable material called Tactel, the Finnish-built 125 ST pants featured bold colors, cool pinstripes (molded right into the Tactel), and a lifetime guarantee. 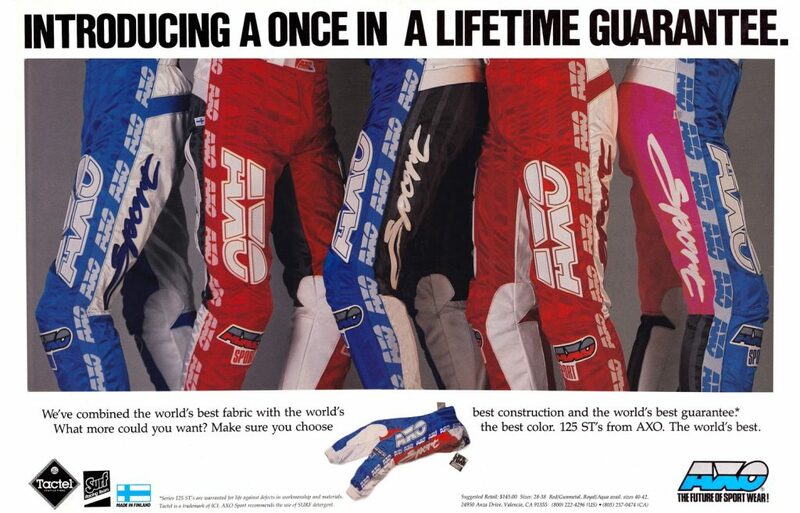 Matthes: I had the blue and pink pair, I was all in on AXO at this point. 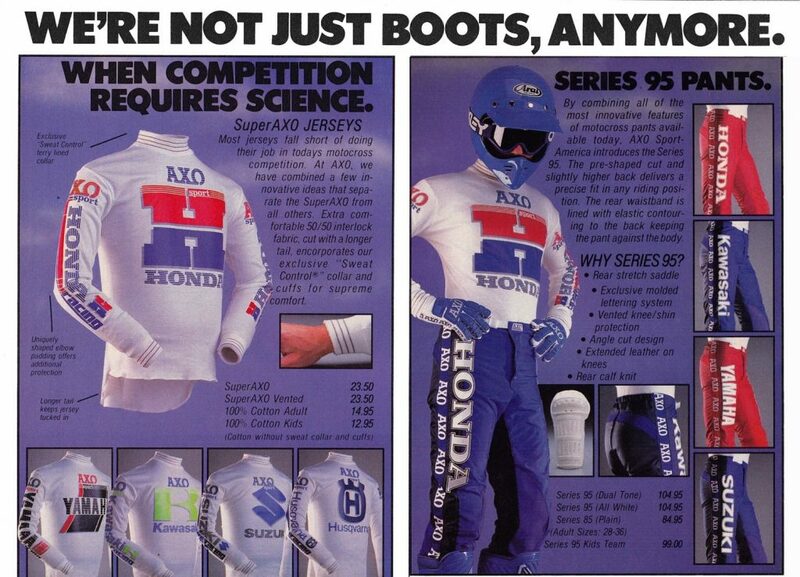 Blaze: For 1989, Honda hired AXO and Answer Racing as the suppliers of their branded TX-10 line of motocross gear. Both versions were pretty good looking, but I think I prefer the pastel colors in the Answer versions to the more traditional (and rather boring) red, white and blue AXO stuck with. 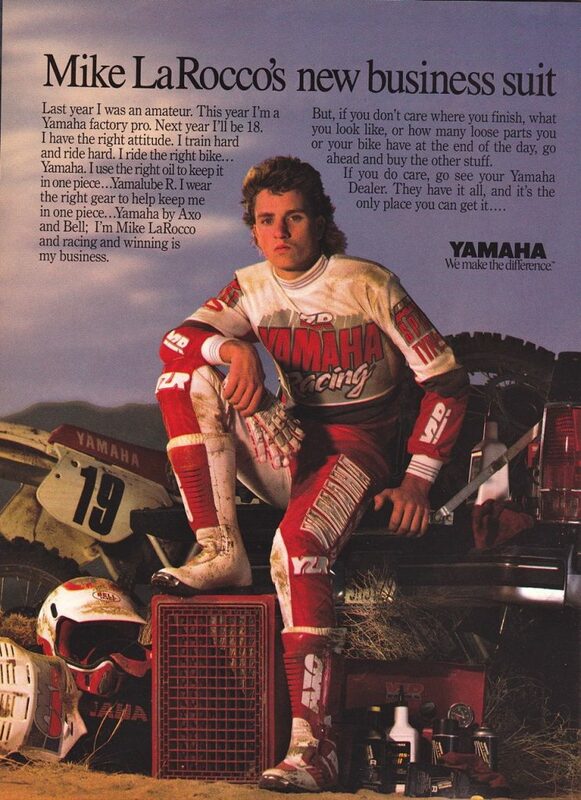 Matthes: Yeah, I feel like Answer did a better job with the Hondaline stuff, but maybe that was just because MX Kied wore it in ’89 and won the title? 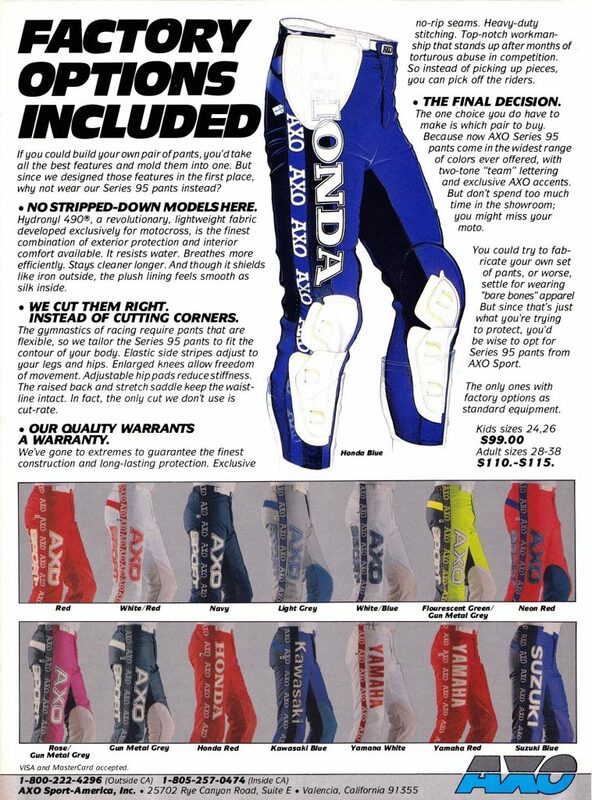 Blaze: If Honda wasn’t your cup of pre-mix, you could always get a Mike LaRocco-approved YZR version of AXO’s gear in 1989. Matthes: I never saw this in person, ever. Blaze: After a successful five year run, the legendary Series 29 was finally replaced in 1989 with an all-new glove. Dubbed the Series 36, this new glove ditched the fussy wrist coverage and Velcro closure of the unloved Series 40 and went back to a simpler design more reminiscent of the original. Even though the Series 36 offered improved ventilation and comfort, the era of the full-coverage plastic-backed glove was coming to an end. Matthes: I don’t remember these. 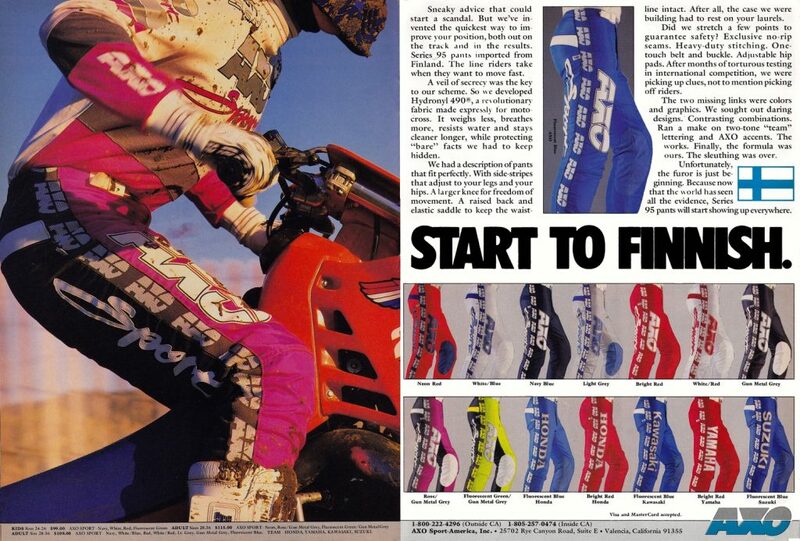 Blaze: Tuf Racing was back at it in 1989, with absurdly colorful versions of the new Series 36. Matthes: So, like, what was the deal here? Antolak bought so much AXO stuff he got exclusive colors? Did I ask Jim about this in the pod? 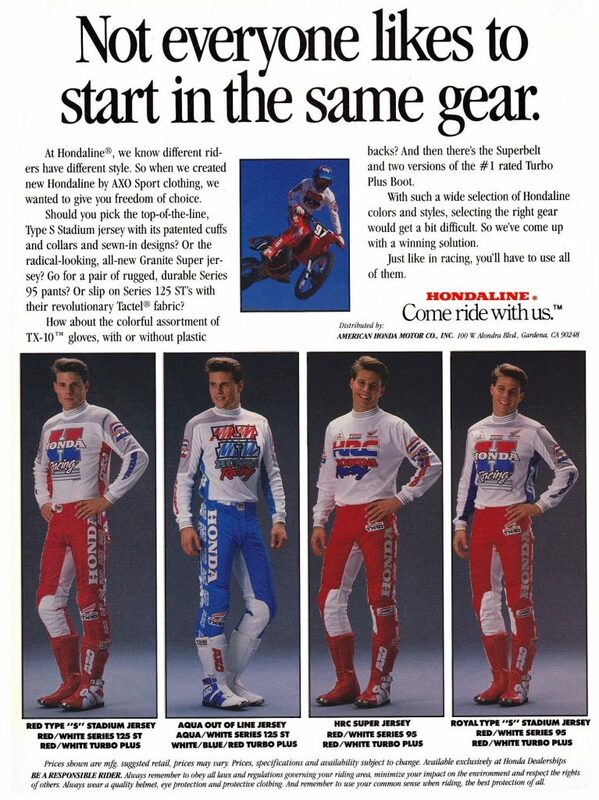 Blaze: AXO’s Limited Edition Granite gear for 1989 was pretty tame compared to the outlandish zebra stripes and spider webs being offered by Fox Racing at the time. Matthes: Ha! Yeah, Granite…I forgot about these. Pretty sure my buddy Curt had a set of this also. Not exactly going out on a limb here with that look. When were the limited editions “Oak Panel” dropping? Blaze: With the all-new Turbo RC boot on the horizon for 1990, 1989 marked the last year for AXO’s incredibly successful Turbo Plus boot. 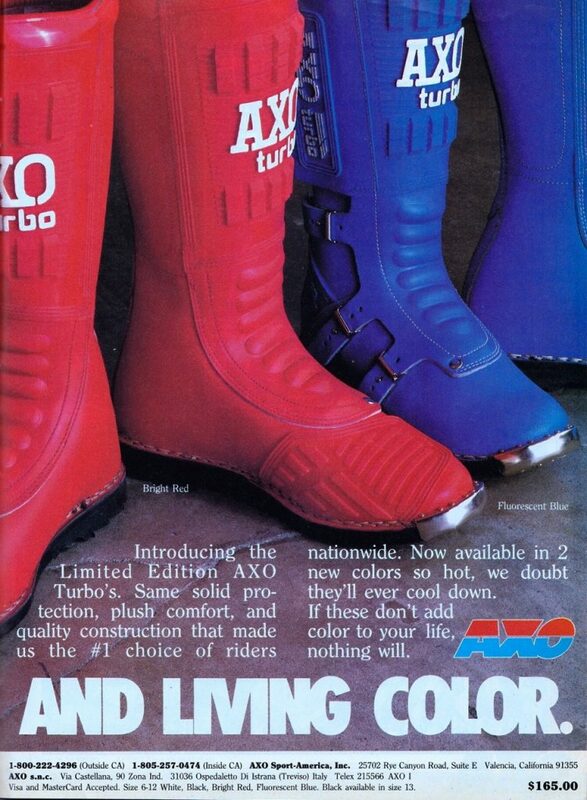 When you counted the TX-10, Tuf Racing and standard AXO varieties, there were over a dozen possible color combos of the Turbo boot available in ‘89. 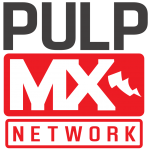 Matthes: Yeah, the Turbo Plus was my jam for sure. I didn’t realize they had all these colors back then. We talk about A Stars doing this now, with so many LE colors and wonder how it’s possible to do it. AXO was killing it in 1989! Fsnatastic guys. Brought me back to the good old days!